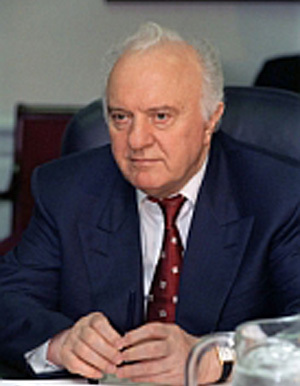 Shevardnadze’s rise to leadership of the Foreign Ministry in 1985, only months after Gorbachev became general secretary, was a “bolt from the blue,” in Chernyaev’s words. Shevardnadze’s talks with Shultz brought a whole new tone to U.S.-Soviet discourse, while the Soviet minister’s growing friendship with Baker, including 1989’s fly-fishing outing in Wyoming, led to actual partnership between the former Cold War adversaries by the time of Iraq’s invasion of Kuwait in 1990. Washington, DC, July 24, 2014 – Former Soviet foreign minister Eduard Shevardnadze, who passed away on July 7, brought a new diplomatic style and candor to bear in changing U.S.-Soviet relations in the late 1980s and ending the Cold War, according to Soviet and U.S. declassified documents posted today by the National Security Archive at George Washington University (www.nsarchive.org). The posting includes the 1985 Politburo minutes of Shevardnadze’s surprise selection as foreign minister, contrasted with the behind-the-scenes account from senior Central Committee official Anatoly Chernyaev in his diary. The e-book also includes the transcripts of Shevardnadze’s remarkable first conversations with his American counterparts, George Shultz (in the Reagan administration) and James Baker (in the George H.W. Bush administration); other memcons featuring Shevardnadze’s leading role in summit meetings between Soviet leader Mikhail Gorbachev and American presidents Ronald Reagan and George H.W. Bush, and Shevardnadze’s last conversation with Bush before the end of the Soviet Union in 1991. Shevardnadze’s rise to leadership of the Foreign Ministry in 1985, only months after Gorbachev became general secretary, was a “bolt from the blue,” in Chernyaev’s words. Shevardnadze’s talks with Shultz brought a whole new tone to U.S.-Soviet discourse, while the Soviet minister’s growing friendship with Baker, including 1989’s fly-fishing outing in Wyoming, led to actual partnership between the former Cold War adversaries by the time of Iraq’s invasion of Kuwait in 1990. But the memcons also reflect Shevardnadze’s frustration with American “pauses” and missed opportunities for dramatic arms reductions across the board, and for earlier domestic political transformation in the Soviet Union. The National Security Archive obtained the Shevardnadze documents through Freedom of Information Act requests to the Reagan and Bush presidential libraries and to the U.S. State Department, and through generous donations from Anatoly Chernyaev. Additional material comes from the files of the Gorbachev Foundation, the Russian State Archive of Contemporary History, and the former Communist Party (SED) archives in Germany. Two key aides to Shevardnadze played leading roles in developing the new Soviet foreign policy during the 1980s, and deserve mention for helping scholars afterwards understand the end of the Cold War. Experienced diplomat Sergei Tarasenko had already served in the Soviet embassy in Washington and provided Shevardnadze with expert advice on relations with the U.S., including in most of the U.S.-Soviet meetings transcribed here. Tarasenko also participated in the seminal 1998 Musgrove discussion published in the award-winning book, Masterpieces of History: The Peaceful End of the Cold War in Europe, 1989 (Budapest/New York: Central European University Press, 2010). Teimuraz Stepanov-Mamaladze served as Shevardnadze’s chief of staff, having come with him from Georgia to the Foreign Ministry, and subsequently donated his invaluable diaries and notes of the period to the Hoover Institution Archives at Stanford University.